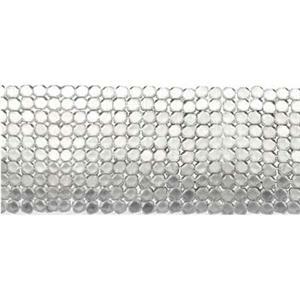 Sterling Silver 1 inch wide, 22 gauge Flexi-Drape Mesh Sheet Metal. See the video below! Super soft and supple chain mail-like silver fabric. This super flexible mesh drapes almost like a fabric. It is soft and flexible and looks absolutely stunning. Glam it up and release your inner diva with this sensational mesh strip. It is sold in strips one inch wide with a maximum continuous length up to 24 inches. Cut out squares or strips to use as light catching dangles. Clamp in place and suspend as fringe. Or, finish as a collar necklace or bracelet. 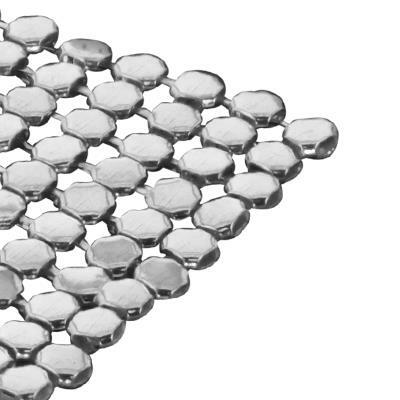 You can link through the mesh for jump ring cold connection or solder along the entire end lengths to finish chain-like applications. Please Note that our Flexi-Drape Mesh Sheet has a maximum and varying manufacturing length up to 24 inches. Be sure to specify your minimum length required in order to insure speedy order processing time. Notes: ** The Flexi-Drape Mesh Sheet is cut at 1 inch when fully extended. It will sit naturally at about .75 inches. When ordering SW series items by the inch please specify your minimum length required in the comments. If you do not specify a minimum length we may use pieces 2 inches or longer to fulfill your order. I was curious about this mesh sheet and so only ordered a small amount to try it out. I should have ordered more! This is lovely, shiny, and has a super soft drape to it. I'd make a whole dress out of it if I could afford it, but for now a bracelet and a choker will be a good start. Unusual and beautiful material... highly recommended!